One way to differentiate these two approaches is to look at how they are evaluated. General advertising is designed to increase awareness and direct is evaluated on the basis of sales results. In reality, direct marketing efforts support the brand and general advertising ultimately increases response rates. Over time, direct marketing became synonymous with direct mail marketing. Unfortunately, that narrow application to direct marketing is flawed. The primary difference between general and direct appears to be in the area of the results they are expected to produce. 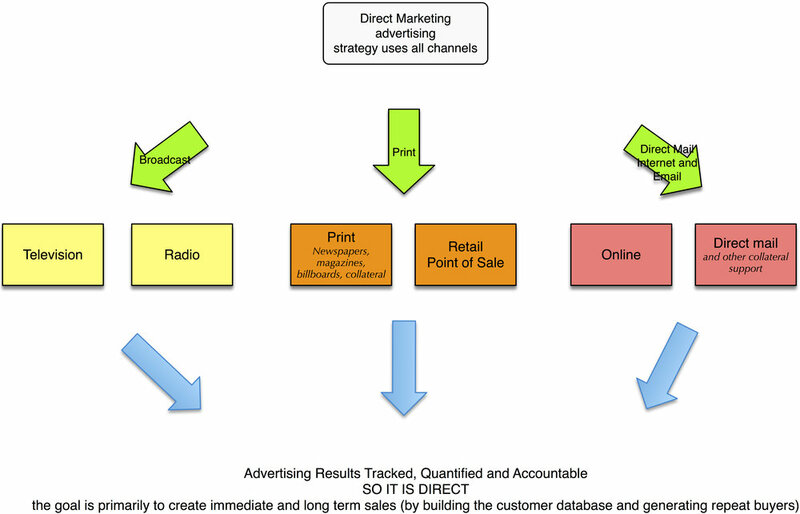 As shown in the following flow charts, both general advertising and direct marketing use all media. They are both directed to the same target markets. And they must both produce sales. For general advertisers, the operational objective is not to increase sales, but rather to position the product and create an environment conducive to sales. And for many general advertising pros, increasing sales becomes an afterthought or a hoped for consequence of properly positioning the product in a sea of competitors. In effect, general advertising is truly an indirect selling strategy as opposed to direct marketing. But here's the rub – some direct marketers believe (and rightfully so, I think) that behavior change may actually position the product and build its awareness while simultaneously promoting an immediate sale. Direct marketers pay attention to the brand and the long term impact of their messaging. But they live or die by the sales coming out of every campaign. They design everything to produce a sale now rather than in some distant future. By the same token, direct marketers want to collect sales information on each customer knowing that the big profits come from repeat customer sales and relationship building rather than first time sales. General advertisers typically do not deal with customer databases, CRM or sales tracking by channel or campaign. Direct marketers think long term. But they also think short term ROI. If I communicate nothing else about the difference between direct marketing and general advertising, it is this. Direct marketing is not a channel or a medium like direct mail, but it is a different way of approaching an advertiser's sales objectives over both the short and long term. Posted on September 8, 2011 by Ted Grigg and filed under Direct Marketing Strategy and tagged #DirectAndGeneralCompared.